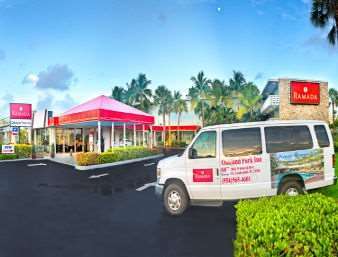 Extend your cruise ship vacation with a relaxing stay at the Ramada Fort Lauderdale Oakland Park, located just seven miles from Port Everglades and eight miles from Fort Lauderdale-Hollywood International Airport. Walk to restaurants and stores. On-site, find an outdoor heated pool with adjoining tiki bar, as well as a lush tropical garden, a fitness center and a business center. Enjoy complimentary wireless Internet access and complimentary hot breakfast buffet. The parking lot accepts cars, buses, trucks, trailers and RVs. Take advantage of airport and local shuttle service. For added convenience, all guest rooms feature microwave and mini refrigerator. No smoking and no pets allowed.